Sometimes we forget what our garden is supposed so be… A respite from the rest of the world. Some place calm, tranquil and relaxing, even if we play and entertain there as well! Introducing water as an element in our garden is a good way to disguise noise in the neighborhood, add a sense of nature, and soothe ourselves. 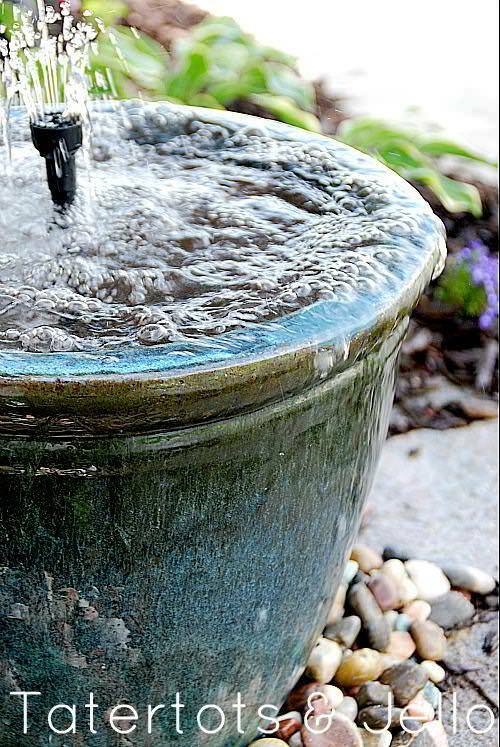 These 7 soothing DIY garden fountain projects are meant to inspire you. We hope you pick one to recreate for your own yard, or at least just convince you that you need one of these. And BTW, making your own fountain saves money over buying one as well. 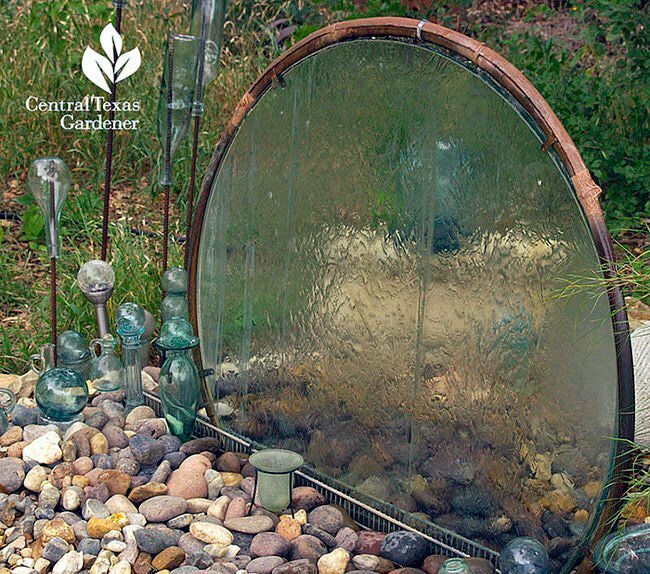 From ‘Central Texas Gardener‘, learn how Elayne Lansford made this glass table top into a water wall. This is amazing! I think we need to head out to the thrift store to look for an old patio table. Good instructions and step by step photos for this DIY garden fountain. Charlotte at ‘Ciburbanity‘ made this DIY garden fountain created with concrete and Goodwill! Click on over to her tutorial to find out what I mean. I love spheres in the garden, they remind us about the circle of everything, which is nature’s deepest truth. Marie (well, her hubby!) 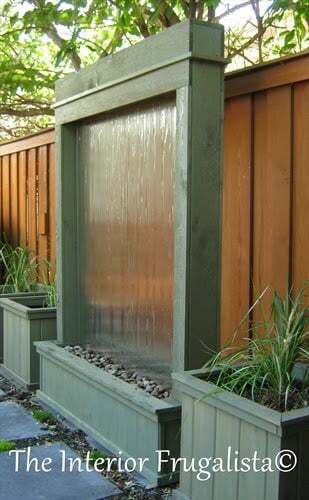 at ‘The Interior Frugalista’ made this DIY water wall for her garden. Lot’s of photos in her tutorial to take you through it, and I love this project! 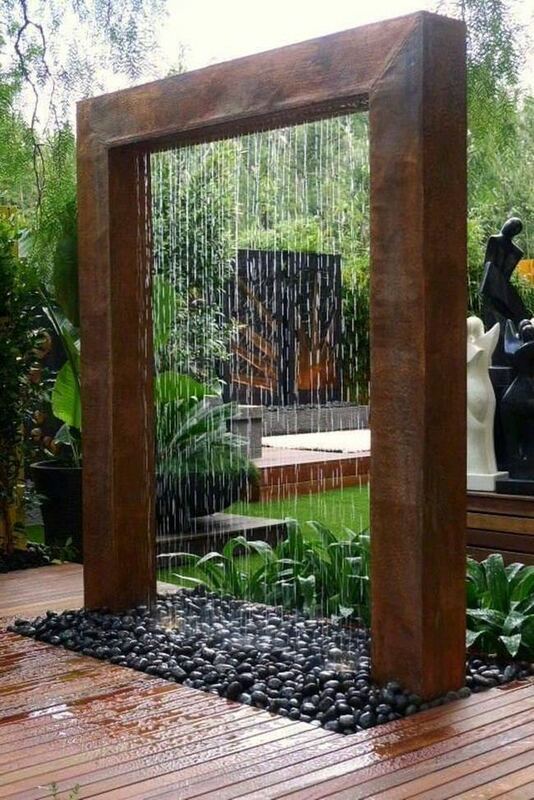 Can you imagine such an amazing piece in your garden? Ok, time to go smaller scale. Jordan at ‘The Happy Homebodies’ has a tutorial on this DIY flower pot fountain that is perfect for a quiet corner. Lot’s of photo’s here too, and great instructions. Jen from ‘Tater Tots and Jello’ has a complete tutorial for her DIY recirculating ceramic pot fountain that would be perfect for my backyard! 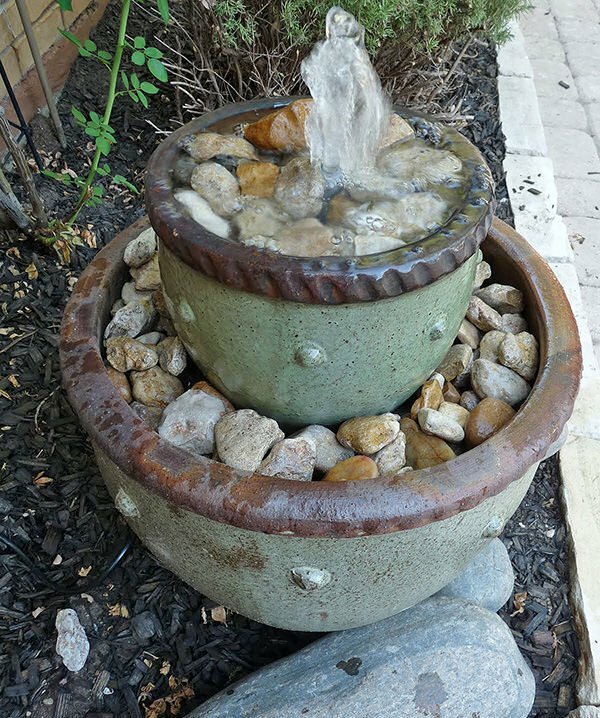 Lot’s of great photos and step by steps as well for this DIY fountain. BTW, if you haven’t visited her site yet, you have to check out her kitchen… since it’s one of my fav’s in the blogosphere! Ok, now for some inspiration! 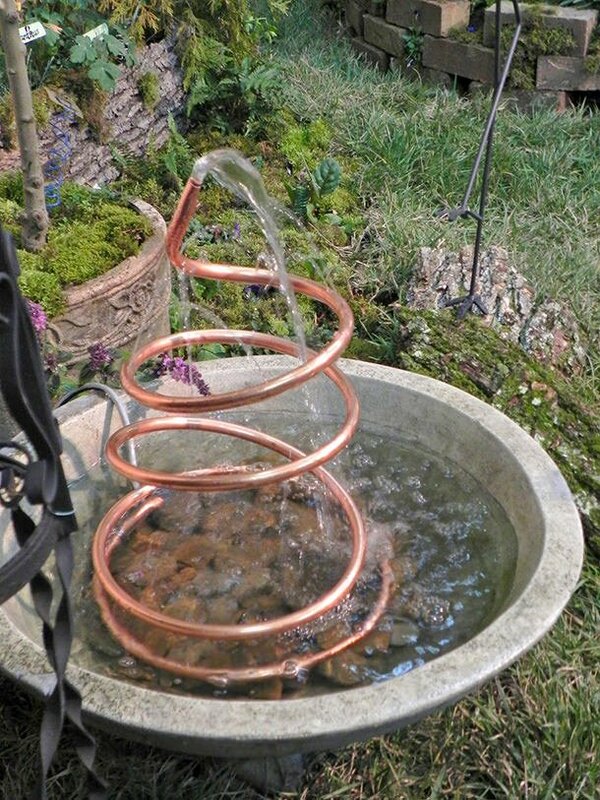 Teri from ‘Gone Walk About‘ took this photo of a copper tubing DIY garden fountain at the Nashville Lawn and Garden Show. Check out all her great home and garden posts at her site! Steve and I think this may be added to our project list. If we decide to tackle it, then we will update with a tutorial! Finally, this copper water wall is amazing, we found it on Pinterest. Unfortunately, look as we might, we could not find a good source for it. If anyone knows where this fountain comes from, please let us know so we can share it with you all! In the meantime, we’ll just dream about this garden fountain! So are you feeling the need for water in the garden yet? 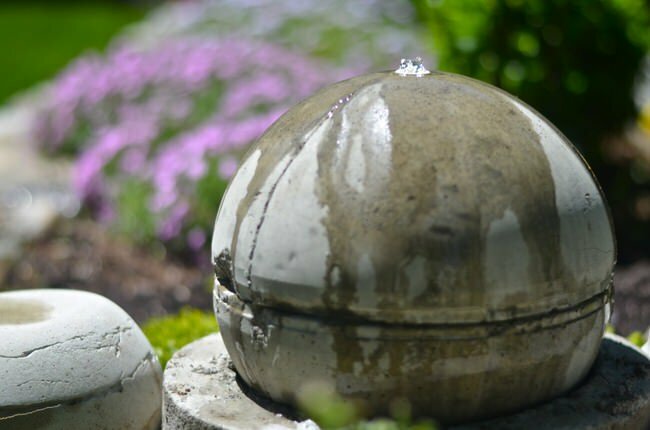 These DIY Garden Fountain Projects should get you started! Don’t forget to pin a favorite (or two!) for later!